Avocado - health benefits and therapeutic value, and beauty tips, too! Avocado is the fruit of the avocado tree or Persea Americana. This tree of the Lauraceae family can grow 40 to 50 feet (12 to 15 meters) tall. Native to Central America, more accurately Mexico, avocado appears in our plates throughout the entire year. With high levels of carbohydrates, avocado offers many benefits for our health and beauty. There was a time when avocado was considered “the poor man’s fruit”. The Aztec people cultivated it over 8,000 years ago. The nickname they had for it was “the testicle tree”. Only in the XVth century did avocado travel overseas to reach Europe thanks to the Spanish explorer, Cortez. Whereas Europeans usually eat avocado for starters, in its native lands it is served as dessert with lemon juice and sugar. Avodaco regulates LDL, or “bad cholesterol”, without reducing or impacting the “good cholesterol”. Avocado thus reduces emergence of cardiovascular diseases, heart arrests and type II diabetes. Avocado contributes to a smooth intestinal transit. It alleviates troubled digestion, inflammations of the digestive tract, and intestinal ulcers. Avocado is very easy to digest thanks to the presence of fiber. Avocado is also recommended for persons who regularly experience constipation. Avocado is also a very good source of vitamin supplements. It harbors vitamin A, which is important for vision. Lacking vitamin A leads to higher rates of vision disorders such as cataract or ARMD (age-related macular degeneration). Avocado is hence recommended to prevent these ocular disorders. Group E vitamins are effective to reduce joint inflammation. Arthritis is another situation where avocado is recommended. Being a source of Vitamin C, a powerful antioxydant, avocado supports cellular regeneration and defends our body against age. Deficiencies in vitamin C otherwise generate stress and tiredness. Avocado prevents infections and stimulates the immune system. It is highly recommended for pregnant women and elderly persons. Appreciated by athletes, avocado compounds muscle growth and helps repair muscle tissue. 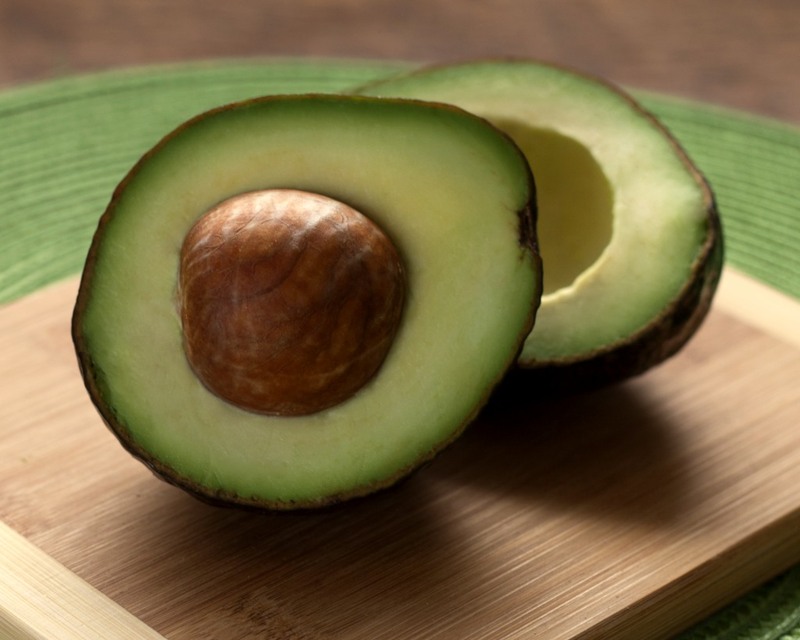 Avocado seed is known to control asthma attacks. There are many ways of eating avocado: raw, salad dressings, mixed salads, stuffed, mousse, in sushi or even guacamole with fresh vegetable sticks to dip before dinner starts. Much healthier and even more delicious, try using pureed avocado instead of butter or mayonnaise. It can also be eaten hot: add cubed avocado to an omelet or scrambled eggs at the last minute. Avocado is a high-calorie food: 200 kcal / 3.5 oz (100 g). But is has many essential fatty acids that still make avocado a great partner in weight-loss diets. It also has very high mineral levels: potassium (520mg) to regulate arterial blood pressure, magnesium (30mg) to regulate stress and reinforce the immune system, iron (0.55 mg) to fight against anemia and carry oxygen (values given for 3.5 oz (100 g)). It also is fiber-rich, 6.7 g / 3.5 oz (100 g), which adjoins it laxative properties. Avocado mousse delight: Mash an avocado, add fresh cream, shallots and lemon juice. Fresh feeling guaranteed! For the finer diners, a shrimp or two can be added to decorate the mousse in a large elegant shot glass. Avocado seed infusion – Peel the thin skin off the seed. Grate the seed. Heat grated seed in a frying pan on low, until the color turns reddish. Then infuse your preparation in boiling water. Ideal to put an asthma attack under control. However, don’t eat excessive quantities of avocado seed, the high levels of tannin might lead to constipation. These leaves are also an effective remedy against canker sores: rinse an avocado tree leaf in water, and then chew the leaf without swallowing it. Avocado oil, a natural remedy against stretch marks – massage areas that are vulnerable to stretch marks (breasts, thighs, stomach) with a preparation of 1½ fl. oz (50 ml) avocado oil and about twenty drops of lemon essential oil. Don’t disdain your feet, nourish them, too: flip the skin of the avocado fruit and rub your feet with it, insisting on the heels. Your nourishing avocado face mask – mash your avocado until it is pureed. Add two teaspoons of lemon juice and honey, and one table spoon or thick cream. Apply to your face, avoiding the eyes. Let it work for 10 to 20 minutes and then rinse off. Is your avocado slow to ripen? To speed its ripening, place it near other fruits or wrap it in newspaper. Making a mess while peeling an avocado? Warm it up for few minutes in the palm of your hands.